In the social media education community, there has been a lot of discussion about teaching social media metrics and analytics to students. This has been a challenge and frustration for myself and many others. Access to industry tools is cost prohibitive for many universities, making it difficult for us as educators to prepare our students for this aspect of their careers. I’ve worked hard over the last few years to try and enhance how I’m teaching these concepts. And I’m not where I want to be. But I know there are many fellow educators also on this journey with me. So, I’d like to share how I teach students to track social media metrics as part of a semester long assignment and a few modifications I have recently made to enhance that aspect of my teaching. I’ve split this topic into two blog posts for length purposes. In both of these posts, we’ll focus on my social media class (2016 syllabus; and all articles about this class). In this post, we’ll talk about the spreadsheet for tracking metrics. In the follow up post, we’ll discuss Microsoft Social Engagement and how I integrate it into the metrics assignment portion of the class. Update: The follow up post on Microsoft Social Engagement is now available. My aim in my social media class is to introduce metrics to students both in lecture & discuss (which I’ve been doing for some years) as well as by use of software. Then, when students get into the Communication Research class (2015 syllabus; articles about this class), they will get more in-depth learning about analytics. I’ve increased/improved my focus on this area in that class for next spring. And my long term hope is to really build that part of the class out. During the upcoming spring semester, I will write a blog post about what we will be doing with analytics. And, at that time, I will share all of my assignments and handouts. Okay, back to my social media class. In past years we’ve used Twitter Analytics – which has been the best, free tool. Unfortunately, other platforms have been limited in their analytics. We’ve used a slew of free tools that have been here today, gone tomorrow. This year, we still faced the challenges of relying on Twitter Analytics and whatever free tools we could find. But I also added a brief introduction to Microsoft Social Engagement (which will be discussed in the next post in this series). But first, let’s discuss how I teach students to track performance metrics in my social media class. In my social media class, students are divided into teams. Each team is in charge of running a social media platform for our department’s social media. In the past, I had my students use a spreadsheet developed by Jeremy Floyd to track metrics. At the time, I modified the spreadsheet for our purposes. At the start of this semester I modified the spreadsheet further simplify it and to add a section on Microsoft Social Engagementƒ (again, which I will discuss in the next blog post). Here is a copy of the spreadsheet as it was distributed in my Fall 2016 class which you can use in following along with the below post. You can also download a copy for yourself to modify and use as you prefer. Again, credit goes to Jeremy Floyd for the original incarnation of this spreadsheet. In lecture, I teach students about the activity, engagement and performance metrics discussed in Kim’s book, Social Media Campaigns: Strategies for Public Relations and Marketing. I also emphasize the importance of choosing metrics that are tied to goals. (You’ll see a tab in the spreadsheet discussed below, where students are to determine their objectives and what metrics would be important to those objectives). Student teams begin with the planning tab, then they establish their metrics goals to use the spreadsheet to establish benchmarks and KPIs for their platform and track metrics over the semester. They then move over to reporting tab to track weekly metrics. Tip. You can see tips by mousing over the small triangles in the upper right corner of some cells, as shown below. I’ve created these to help students when working on their spreadsheets in groups. In the image below, you can see the ‘reporting’ tab of this spreadsheet. We start tracking in week 9 of the semester, but you can modify this as you like. After each week, you’ll see the percentage change. Of course, you can also modify what you are tracking. I throw in a number of potential metrics to track for different platforms. But, students can delete all the rows they don’t need and modify the individual metrics for that platform as needed. The metrics identified in the spreadsheet are just a guide. I’ve also divided the spreadsheet up into different platforms so each team can pick their platform (as shown in image below) for tracking the success of their posts. The idea here, is that by tracking these posts across time, students can begin to analyze these metrics for trends (though, I don’t have any ways to quickly analyze and visualize this data at this time). This could help them learn when the best time to post is. However, you could also add variables about the post that can help them identify which is the type of content that is most successful. Other spreadsheets I’ve seen track variables such as whether an image was used, what hashtags are used, if links are used, etc. So, again, you can modify the optimization section as you see fit. I discuss other variables to track, but focus on the ones in this spreadsheet so as to not overwhelm students. I’ve found if I ask students to track too many things, nothing gets tracked as they get overwhelmed. So choose what you want them to track, and stick with it. 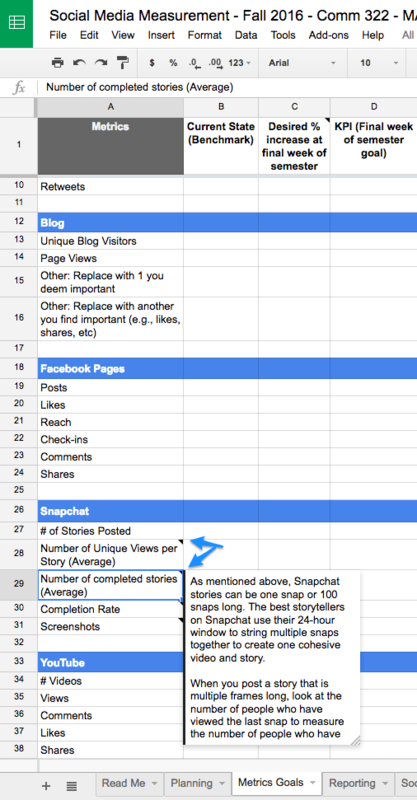 I’ve relied on Kim’s metrics categories for metrics students can track. Also, please know the metrics I have identified isn’t perfect and modification of what I’ve identified may be needed – some of my initial metrics may not work, or changes have occurred. As noted above, across the entire semester of my social media class, students are strategizing, building and executing social media for my class. As a part of that, they present their content to the class for approval at intervals throughout the semester. In the latter half of the semester, the students present their current metrics to the class alongside the content they are proposing for the next content time period. At the end of the semester, we discuss their metrics, whether they met their KPIs and during what week they did, and what they learned from them. While the above enables us to track interaction with our social content and extract some insights, it doesn’t account for listening to competitors, following trends, etc. It also doesn’t take deeper analytics and the extraction of insights into consideration. We don’t do anything to plot or discern specific insights – I am saving that for the Communication Research class this spring. 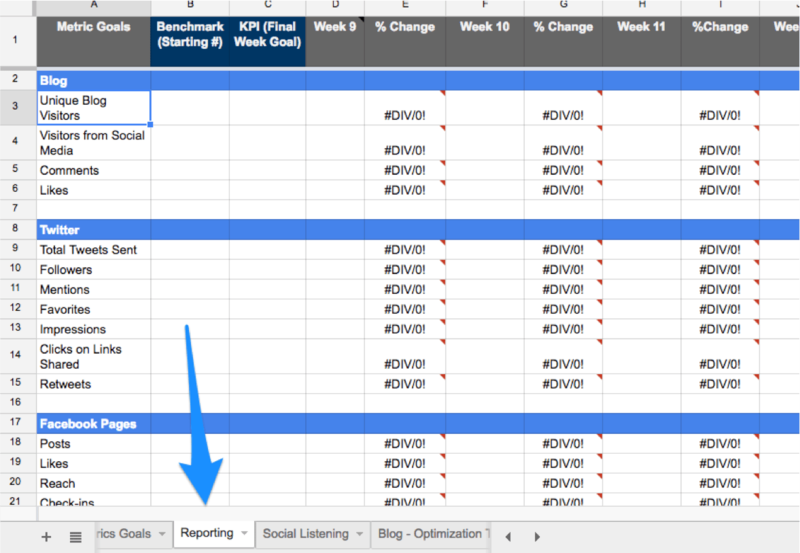 Said another way, the assignment and use of this spreadsheet in my social media class, as I executed it in Fall 2016, was really more about tracking metrics, following change and teaching students to see the impact (outcome) of their efforts on social media, while connecting those back to objectives and KPIs. In the next blog post, I go into the “social listening” tab of the spreadsheet and discuss how students got a little hands on use with Microsoft Social Engagement in my social media class during fall 2016. In the meantime, if you have any thoughts or suggestions or resources you’d like to share about teaching metrics to students, please share them with me and the readers via a comment in the post or Tweet me. This is an important journey for all of us as we work to enhance hands-on metrics learning for our students.